Gain strength, clarity, and a deeper knowledge of yourself on this eight day mountain adventure. 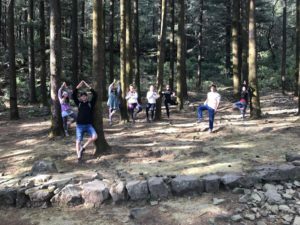 Immerse yourself in the tradition of yoga, trek to an awe inspiring glacial lake atop a mountain, make a difference at a local school, and connect with people from all over the world. 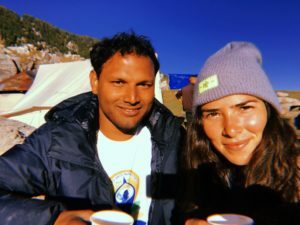 Ravi and Gabba-Ji are ready, willing, and more than able, to help facilitate your trip to India! I’m Gabba-Ji, and I lead adventure retreats with environmental and social initiatives. I’m from Nicaragua and the US, and I am currently based in Miami, FL. My retreats are inspired by a love of travel and an appreciation for our earth. My goal is to provide socially conscious and environmentally responsible travel around the world, to the world. 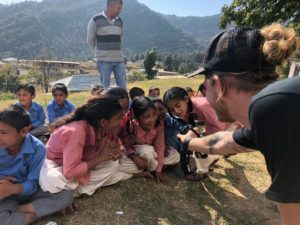 My mission to create sustainable retreats with social and environmental impact, came through my experiences travelling through the Himalayas in 2015, 2016, and 2018, and a strong will to eradicate litter and pollution by taking action through cleanups and spreading change through education. I organize trips to the Indian Himalayas focused on personal growth and appreciation for nature. We focus on four fundamental pillars: Self Study, Empower Others, Connect with Nature, and Sustainability. We practice authentic and traditional styles of Yoga and Meditation daily, and learn Yogic principals from my co-host and teacher Ravi Krishna Achariyia. We create social impact by teaching environmental practices to the children of Kareri Village School. 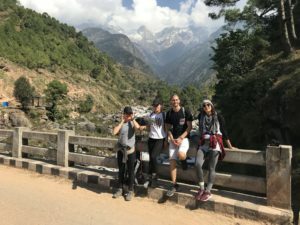 We set off on a four day three night trek through the Himalayas to Kareri Lake, collecting litter along the way, volunteering, and spending quality time in the great outdoors. I have never witnessed a more visible pollution problem than I have in India, and it is truly eye opening. What is interesting to me is that traditional Indian culture is environmentally sound and sustainable: sustainable materials like bamboo and clay are used in daily life and urban infrastructure, food is locally grown, nothing goes to waste, everything is eaten, and reused. Global industry has negatively influenced the environment in India; disposable plastics and environmentally unfriendly materials have been integrated into the economy without proper education on how to make use of and dispose of these products. While there is a level of corporate responsibility that needs to be addressed by policy makers on an international scale, nonetheless, on an individual level, we all have the responsible to do everything within our power to change. We can educate on the ways in which litter should be disposed of so that the natural beauty of the Himalayas can remain intact. A return to, and a celebration of local heritage is an important step that we can take in combating pollution crises. It’s important for travelers to not only witness, but to experience life the way a local would in order to recognize the impact of modern tourism as being unsustainable. My trips aim to have travelers lead by example: teaching eco-friendly practices to the locals, and to clean up what litter we find along the way. Most importantly, we pass on the message to future generations on our social impact day at Kareri village school. How do you integrate tourism and sustainability at the same time ? One of the four pillars of action that we take on the trip is Sustainability. We teach our travellers about zero waste practices, and we pick up litter along the way during our trek. I encourage guests to bring reusable water bottles so as to avoid single use plastics. We volunteer at a school and teach green initiatives to the school children in remote villages where education surrounding recycling and dangers of burning plastics are not widely known. Why do you partner with My Green Trip ? I am looking for help from a partner to support my cause, and it is clear to me that My Green Trip also possesses a similar vision. I think we can work together as like-minded organizations and increase the popularity of sustainable travel, while make it fun and rewarding at the same time! Thanks for taking the time to read this, I hope to see you in the Himalayas in 2019!